Data Mining and Information Systems: Quo Vadis? Information and communication technology has been a steady source of innovations which have considerably impacted the way companies conduct business in the digital as well as the physical world. Today, information systems (IS) holistically support virtually all aspects of corporations and nonprofit institutions, along internal processes from purchasing and operationsmanagement toward sales, marketing, and eventually the customer (horizontally along the supply chain), from these operational functions toward finance, accounting, and upper management activities (vertically across the hierarchy) and externally to collaborate with external partners, suppliers, or customers. The holistic support of internal business processes and external relationships by means of IS has, in turn, led to the vast growth of internal and external data being stored and processed within corporate environments. We would like to thank all authors who submitted their work for consideration to this focused issue. Their contributions made this special issue possible. We would like to thank especially the reviewers for their time and their thoughtful reviews. Finally, we would like to thank the two series editors, Ramesh Sharda and Stefan Voß for their valuable advice and encouragement, and the editorial staff for their support in the production of this special issue (Hamburg, June 2009). Freitas, A. On rule interestingness measures. 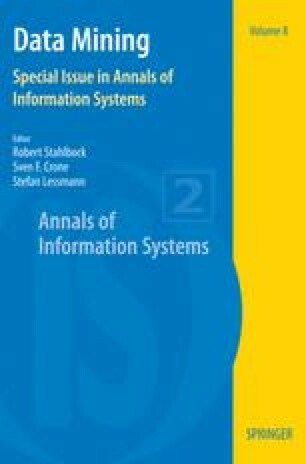 Knowledge-Based Systems, 12 (5–6): 309–315, October 1999. URL http://www.cs.kent.ac.uk/pubs/1999/1407. Narayanan, A. and Shmatikov, V. How to break anonymity of the Netflix prize dataset, 2006. URL http://www.citebase.org/abstract?id=oai:arXiv.org:cs/0610105.